Monaco; the little micro-state on the French Riviera where the rich and famous come to play. This is where Bianca and Espen from Team Agile went this March. This was no ordinary conference. This was a conference that gathered 1,300 of the leading researchers, clinicians, and physicians from every corner of the world, each with a common goal to prevent injuries and illness. It was the fifth official IOC conference, and is held only once every 3 years. You may understand why, what with 5 keynote speakers, 33 symposiums, over 70 workshops, and (last but not least) close to 250 posters of research straight off the press. It is the Olympics of the best in each field, where everyone won gold. This is where Bianca came in. 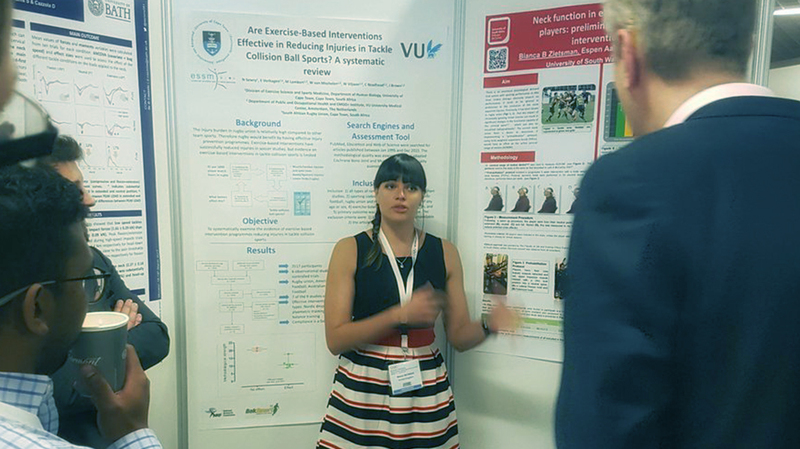 She has created a neck pre-habilitation programme to minimise the risk of injuries in rugby players and increase neck function, but not specifically rugby, just tested in this field. It was all based on a simple idea- in sport, we are generally good at conditioning our legs, arms, and sometimes even our elusive core, but very few athletes condition their neck. Ask yourself, when did you last consciously exercise your neck muscles? If your answer is never, you are not alone. Bianca, with the help of Espen, implemented a protocol in one of our very own Welsh Championship rugby teams, Beddau. The data presented how an 8 week pre-hab protocol can positively affect neck function, with just 4 minutes of exercise a week. This study was one of only a handful of implemented prevention protocols, and simple enough that it can be implemented across a large range of people. The main message from the conference conveyed there is no way of predicting who will get injured, there are hundreds of screening protocols, not a single one of these are able to predict this. It would be like predicting the weather in Wales: impossible. What we can do is control the controllables, be that through exercise, nutrition, psychology, manual therapy and prevention protocols. Overall, we have to say the conference was a massive success, and amongst the Ferraris and the champagne, even Prince Albert II of Monaco dropped by for dinner (he owned the place after all). The weekend ended on a slightly unfortunate note when we watched the Welsh rugby boys lose in the 99th Minute to a strong French side but we have brought high spirits and a fresh outlook back to Agile and are already looking forward to the next one! Next Next post: How can foot orthoses help with injury?